Fudgy brownies, creamy chocolate frosting & delicious Easter candies – what’s not to love about these Mini Egg Brownies? These incredible brownies are the perfect Easter treat. 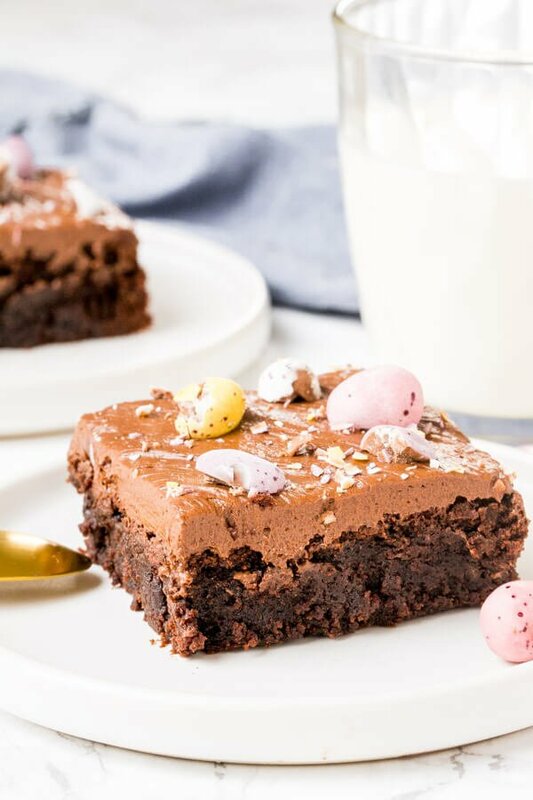 If you’re looking for a delicious, easy, chocolate dessert for Easter – then these mini egg brownies are for you. 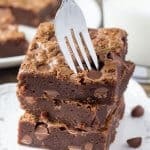 The brownies are chewy, fudgy, and somewhat reminiscent of box-mix brownies in the best possible way. Then they’re topped with milk chocolate frosting and a sprinkling of miniature eggs. I can’t be the only one obsessed with Cadbury Mini Eggs. 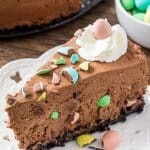 The creamy milk chocolate, crunchy candy coating, pretty pastel colors – they might just be the perfect Easter candy (which is a pretty tall order if you ask me). 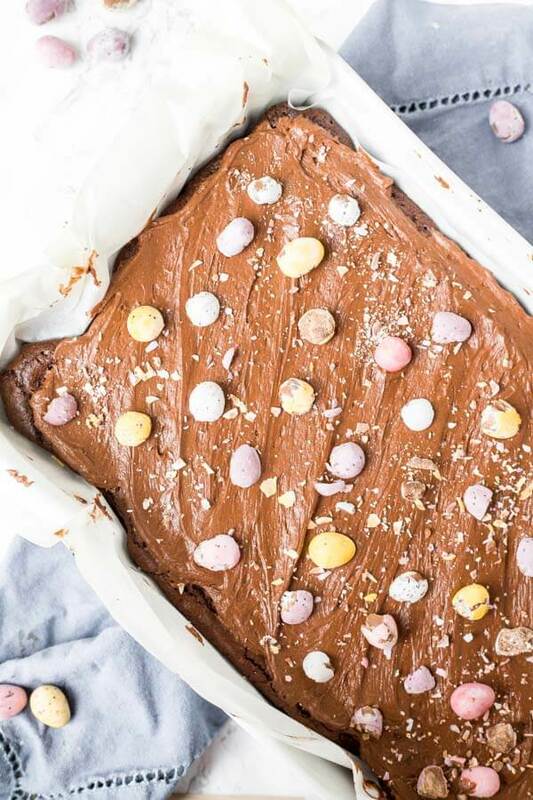 I’ve made a few treats with mini eggs before, but since my love for mini eggs runs deep, these mini egg brownies were clearly needed. This mini egg brownie recipe makes a big batch. We’re using both melted chocolate and cocoa powder to give them a rich chocolate flavor and fudgy texture. And best of all – the brownies can be made in just 1 bowl. 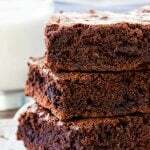 Be very careful not to add too much flour, otherwise brownies can get dry. When adding the flour, gently fold it in using a rubber spatula. This helps to keep the brownies fudgy and gooey. Last but not least – I prefer to slightly under bake my brownies for gooier centers. Then after the brownies are done baking, it’s time for the chocolate frosting. Simple, creamy, delicious. It’s made with butter, powdered sugar, cocoa powder, a touch of salt, and milk. It’s not super rich, so it works well with the brownies. And for the final hurrah – mini eggs on top. I bashed mine with a rolling pin so that some were “hatched”, and I also had some little colored candy pieces for decoration. 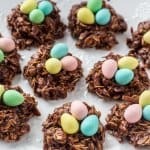 You can make these mini egg brownies for Easter to help celebrate, or even make them after Easter to use up leftover candy. Either way – you really can’t go wrong with mini eggs and brownies! 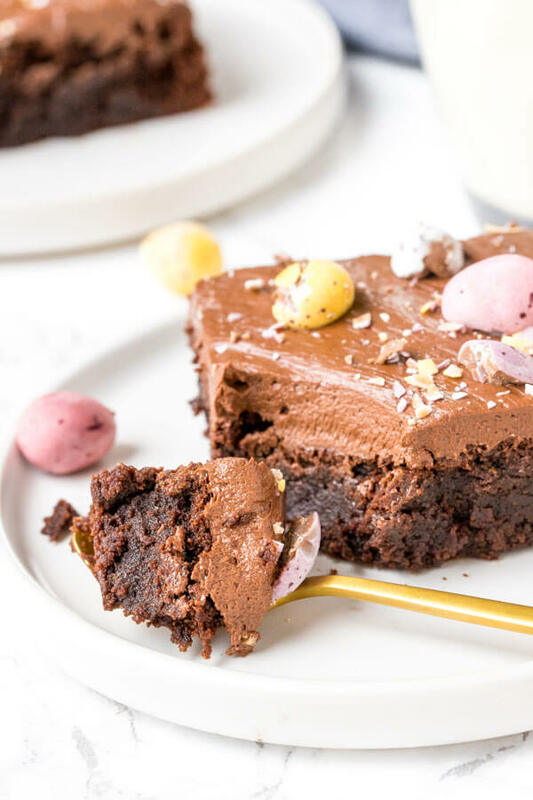 Fudgy brownies, creamy chocolate frosting & delicious Easter candies - what's not to love about these Mini Egg Brownies? These incredible brownies are the perfect Easter treat. Line a 9x13 inch pan with parchment paper, or line with aluminum foil and lightly grease. Add the butter and dark chocolate to a large bowl. Microwave on medium power for 1 minute, remove from the microwave and stir. Repeat the process until the mixture is smooth. Add in the vanilla extract, then whisk in the eggs 1 at a time. Gently fold in the cocoa powder, flour and salt using a rubber spatula or wooden spoon. Pour the batter into the prepared pan and bake for 28-32 minutes, or until an inserted toothpick comes out clean or with a few damp crumbs. Cool fully before frosting. In a medium bowl, beat the butter until soft. Beat in the cocoa and powdered sugar about 1/2 at a time, starting with the mixer on low speed. Beat in the milk about 2 tablespoons at a time, until the mixture is creamy and smooth. Before opening the bag of mini eggs, bash the bag with a rolling pin to crush them slightly. Then sprinkle the mini eggs on top of the frosted brownies. Store brownies in an airtight container at room temperature for up to 2 days, or in the fridge for up to 4 days.